While the markets are flooded with soaps that promise to be advantageous for your skin, we know that there are hardly that make a difference. Most of them contain harmful chemicals on the contrary to what they claim. 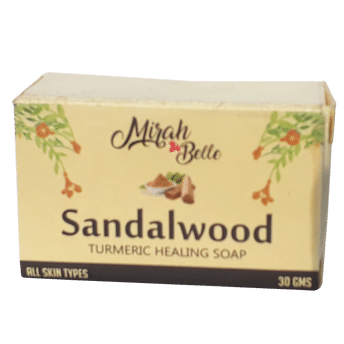 Mirah Belle Sandalwood-Turmeric Healing Soap aids in keeping your skin cool, fresh and smelling beautiful all at the same time. It helps in preventing skin itchiness, reduces inflammation, and keeps any kind of skin odour at bay, thereby healing your skin. It is 100% free of chemicals and is safe to use by both children and adults. Sandalwood Oil: Extracted from the fragrance-filled sandalwood trees, this oil has great skin benefits. Not only is its smell heavenly, but it works like magic on your skin too. Owing to its skin cleansing properties, it helps to keep your skin clear by preventing scars, pimples, acne, and other signs of aging like blemishes and wrinkles. Its soothing effect helps to heal skin inflammation and/or itchiness. Sandalwood oil has antispasmodic properties that helps to relieve you of muscle spasms as well. It is antimicrobial in nature, which makes it an effective antiseptic agent for cuts, injuries and so on. Its beautiful aroma helps to drive out body odor problems too! Turmeric Oil: We have all heard and already know about the numerous medicinal benefits that turmeric has. Well, the oil extracted from it is no less. It has countless skin benefits. As it has antibacterial and antifungal properties, it helps to dry the pimples out, and prevents further development of acne. It gives you skin that is free of blemishes owing to its power of cleansing the skin. It has a substance called alpha-curcumene, which makes it anti-inflammatory in nature thus reduce skin inflammation. It improves the elasticity of your skin, making it firmer and thereby helping you to look younger. It helps to rejuvenate your skin. Organic Soap Base: To make the soap base, no harmful chemicals were used. Ingredients like vegetable oil, Glycerin, goat milk, shea butter are used to make the base, which works to keep your skin well-nourished, moisturized and helps it to glow like a moon. Explore the entire range of Soaps available on Nykaa. Shop more Mirah Belle products here.You can browse through the complete world of Mirah Belle Soaps .Alternatively, you can also find many more products from the Mirah Belle Sandalwood Turmeric Healing Soap range.